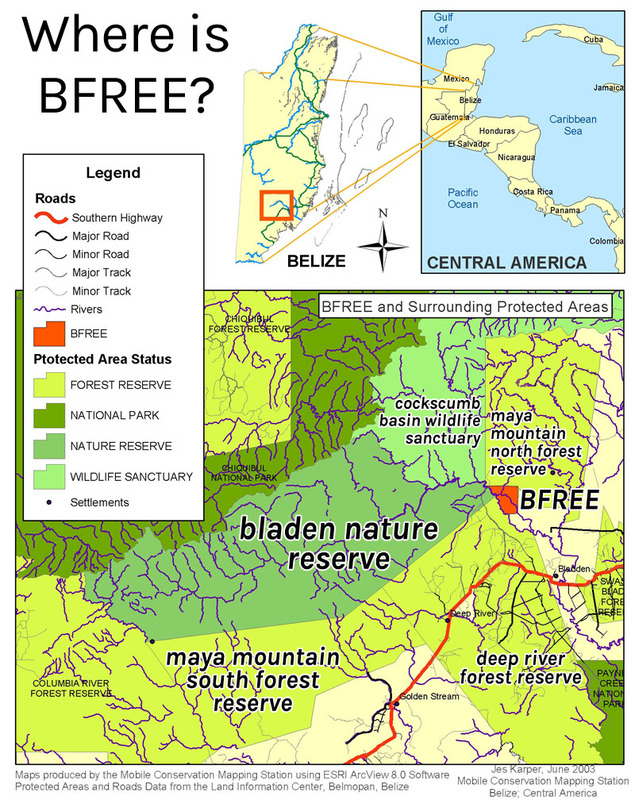 BFREE supports and manages a private research and educational facility located in southern Belize on 1,153 acres of tropical rainforest nestled in the foothills of the Maya Mountains along the crystal clear Bladen River. Four protected areas adjoin the BFREE reserve and field station, including Bladen Nature Reserve, Cockscomb Basin Jaguar Reserve, Deep River Forest Reserve, and Maya Mountain Forest Reserve. These four areas combined equal over 1.5 million acres of continuous tropical rainforest. As one of the largest protected tropical rainforest ecosystems left in Central America, it is often referred to as the last remaining truly unspoiled wilderness areas of its kind. Belize is a small country located on the northern Caribbean slope of Central America. Despite the modest population of roughly 333,000, Belize hosts a great diversity of cultures including Creole (Kriol), Mestizo, Mayan, Garifuna, Spanish, Mennonite as well as European. The national language is English; however, many local people are bi- or tri-lingual, speaking Creole, Spanish, Garifuna, or one of three Mayan dialects (Mopan, Ke’kchi or Yucatec). Considered to harbor some of the most biologically rich ecosystems on earth, Belize has more than its share of pristine beauty sculpted in mountains, tropical rainforest, ancient Mayan kingdoms, extensive caves, meandering waterways, and the spectacular barrier reef system. Belize’s unspoiled tropical forests are home to more than 500 species of birds, 700 species of butterflies, over 180 species of amphibians and reptiles, and healthy populations of mammals and top predators such as jaguars, mountain lions, ocelots and margays, as well as tapir, howler and spider monkeys. No other country can boast a greater percentage of its landmass dedicated to natural reserves, parks, and preserves. The Bladen Nature Reserve is a 97,039-acre protected area on the Southeast flank of the Maya Mountains and is considered the crown jewel of Belize’s protected area system. The Bladen consists of two geologic areas; a granitic and volcanic ridge runs parallel along the northern half of the reserve and a limestone section lies along the southern half. The pristine Bladen River is the border between these two geologic areas. The few expeditions into this wilderness have revealed a biological wonderland – magnificent tropical rainforests, new species of both plants and animals, and scores of newly discovered Mayan Ruins. The flora of the Bladen Nature Reserve is becoming more significant as other similar vegetation types around the country are impacted by agriculture and logging. The Bladen Nature Reserve receives Belize’s highest protected status and entrance to the BNR is by permit only for research and education. No tourists are permitted to enter the reserve. This strict protected status is necessary to protect one of the last great wilderness areas left in Central America. Since the late 1990s, BFREE has made the management of the Bladen Nature Reserve its priority and over the years, has worked with other entities to establish an official management plan for the reserve. Currently, the Bladen Nature Reserve is co-managed by the Forestry Department of Belize and Ya’axche Conservation Trust (YCT). The Maya Mountains encompass a low range of karst hills concealing hundreds of cave systems (some of the largest in the Western Hemisphere), ascending to mountain ranges with elevations just under 4000 feet with Victoria Peak (3680) and Doyle’s Delight (3685) reported as the highest. Although most of the peaks of the Maya Mountains are more rounded, the spectacular Cockscomb spine is all that remains of earlier mountains. Often referred to as the “Sleeping Giant,” this geological feature is a national landmark. Scant elfin forests are found on the highest peaks, while great expanses of lowland tropical rainforest disappear to the horizon in every direction. Annual rainfall can range from 70 inches in the north to over 200 inches in the south each year.